The South African Deep-Sea Trawling Industry Association (SADSTIA) announced today it is to sponsor 11 paid and structured internships for the period 1 April 2019 to 31 March 2020. The internships will form part of WWF’s highly successful Graduate Internship Programme which aims to provide a practical bridging experience for new graduates to make a career in the field of environmental sciences. As the only fishery in Africa to be certified as sustainable and well-managed by the Marine Stewardship Council – the world’s leading certification and eco-labelling programme for wild-caught seafood – SADSTIA already works closely with WWF on a range of fisheries improvement projects. 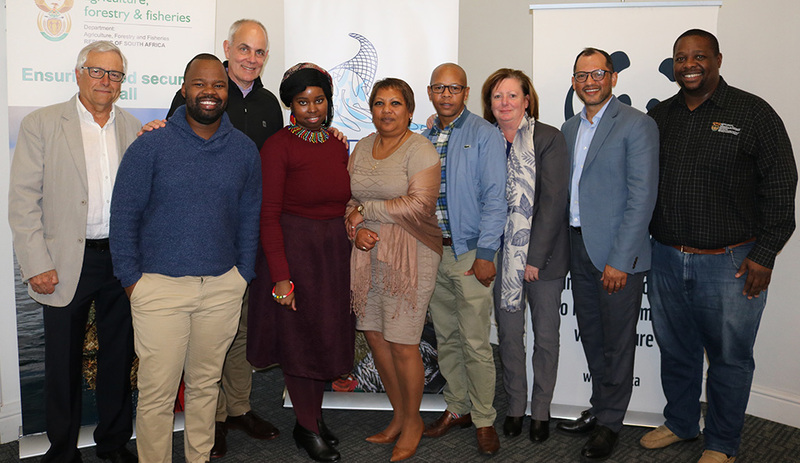 DAFF has played a key role in the establishment of the internship programme and representatives of the Department expressed their appreciation for the opportunity of working with SADSTIA and WWF to tackle the critical problem of youth unemployment. The Department believes the programme will not only provide opportunities and inspiration to to new graduates, but it will help to secure the skills necessary to manage sustainable fisheries into the future. It intends to use the internship programme to build a cohort of young professionals skilled in freshwater aquaculture information management, feed development and animal health and husbandry. Representatives of SADSTIA, WWF and DAFF launched an internship programme in Cape Town in September. Pictured from left are, Johann Augustyn, secretary of SADSTIA; Madoda Khumalo, strategic services executive at Sea Harvest and head of SADSTIA’s Scientific Committee; Morné du Plessis, CEO of WWF-South Africa; Fisokuhle Mbatha, SADSTIA research assistant; Glenda Raven, director of the WWF Graduate Internship Programme; Belemani Semoli, acting director general of the Fisheries Branch of DAFF; Sue Middleton, chief director of Fisheries Operations Support in the Fisheries Branch of DAFF; Terence Brown, operations director of Sea Harvest and chairman of SADSTIA; and Saasa Pheeha, acting chief director of Fisheries Research & Development in the Fisheries Branch of DAFF.